Chocolate Peanut Butter Ice Cream Cookie Cups. 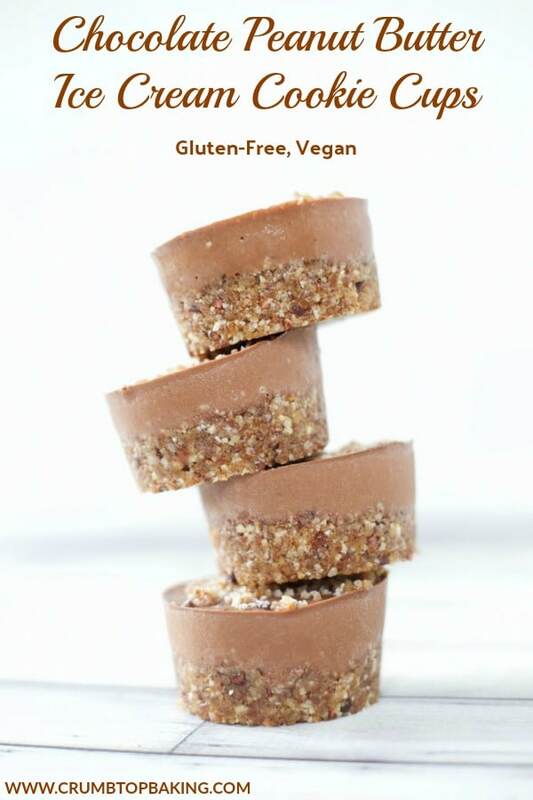 My all-time favourite clean eating dessert! Pretty bold statement, but I promise, if you love chocolate and peanut butter, you need this recipe in your life! It’s creamy chocolate peanut butter banana nice cream nestled on top of a no-bake hazelnut crust. And the best part? These mini cookie cups take just 10 minutes to make, use only 7 ingredients and require no oven time! Does it get any better? When I first started clean eating, chocolate peanut butter nice cream was my go-to dessert. I love the chocolate and peanut butter combo, and when you add frozen banana, you get a rich and creamy dairy-free ice cream. Add some nuts, unsweetened coconut and dairy-free chocolate chips, and you have yourself a “nice” and healthy sundae of sorts! 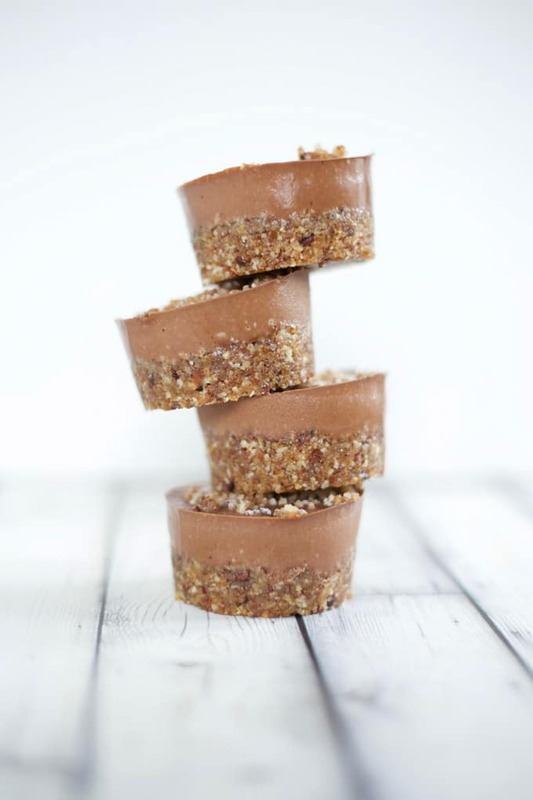 Baked pecan crust with coconut oil, no-bake almond crust with almond butter, no-bake pecan crust with peanut butter…..you get the picture. They were either too chewy or too oily and definitely did not freeze well. Don’t get me wrong, they were still edible but just not spectacular 😉 . A few weeks ago, I had some bananas rotting away on the counter, (seriously, they were that far gone, they could have peeled themselves! ), so I thought I would play around with the chocolate peanut butter ice cream recipe again. But instead of making a pie crust, I decided to use mini baking cups. Anything mini is usually super cute, and individual serving sizes are much easier to sneak out of the freezer 😉 ! When I was assembling the ingredients, I came across a bag of hazelnuts in my cupboard, and it occurred to me that hazelnuts might make a nice cookie crust. 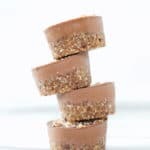 I used them in these Chocolate Hazelnut Energy Bites and they weren’t too oily, so I figured it was worth a try. I kept it simple and just added the hazelnuts to my food processor, along with some dates, coconut palm syrup and natural peanut butter. It turned out to be the perfect consistency, and the hazelnuts added a nice (Ferrero Rocher like) taste to the cookie crust 🙂 . And just a note on coconut palm syrup. Have you ever tried it? I picked it up at the supermarket a few weeks ago and I’ve been adding it to everything lately. It’s thick like honey, but dark in colour like maple syrup, and has a sweet caramel taste. I’ve been using it in place of honey and maple syrup in recipes, and as a syrup on flourless waffles and protein pancakes. If you follow my Instagram stories, you may have seen some of these breakfast treats over the past few weekends! Be sure to look out for some waffle and pancake recipes on the blog this fall. 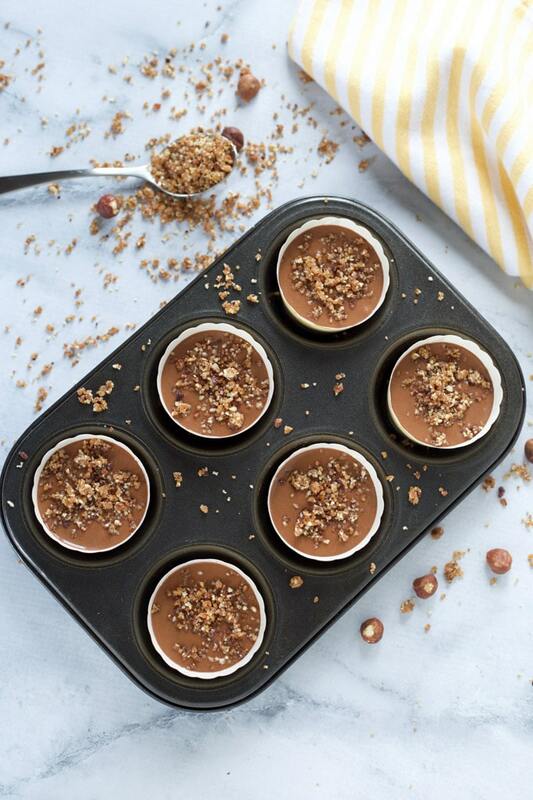 In the meantime, enjoy these Chocolate Peanut Butter Ice Cream Cookie Cups, and soak up the rest of summer! 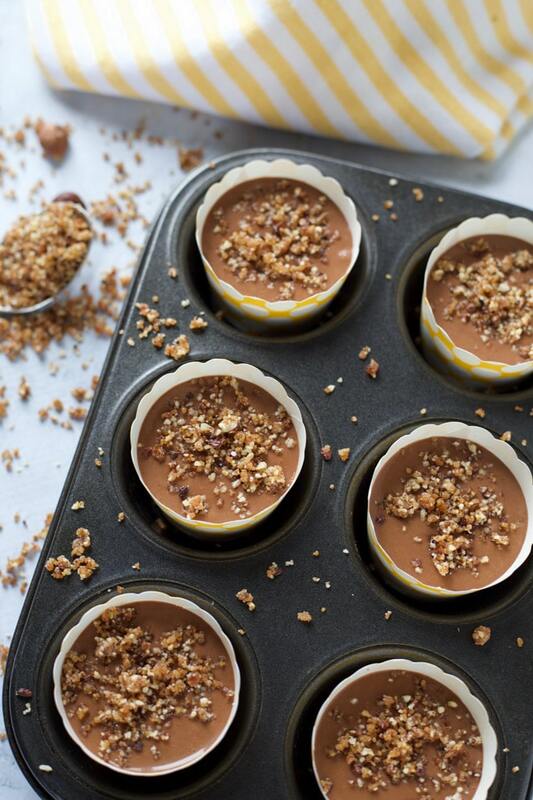 If you love chocolate and peanut butter, you need these Chocolate Peanut Butter Ice Cream Cookie Cups in your life! It’s creamy nice cream made with bananas, peanut butter and cocoa, and nestled on top of a no-bake hazelnut cookie crust. They take just 10 minutes to make, use only 7 ingredients and there is no oven time required. Yay! In a food processor, combine the dates, hazelnuts, 2 tbsp of peanut butter and coconut palm syrup and process on high for 3-5 minutes until the mixture is fine and crumbly. Divide most of the mixture into 6 small paper baking cups (not cup cake liners) and press into the bottom of the cup. Place in a 6-cup muffin tin. Reserve a little bit of the mixture to sprinkle on top of the nice cream cups. In a blender, add the bananas, 1/4 cup peanut butter, almond milk and cocoa. Blend until creamy. 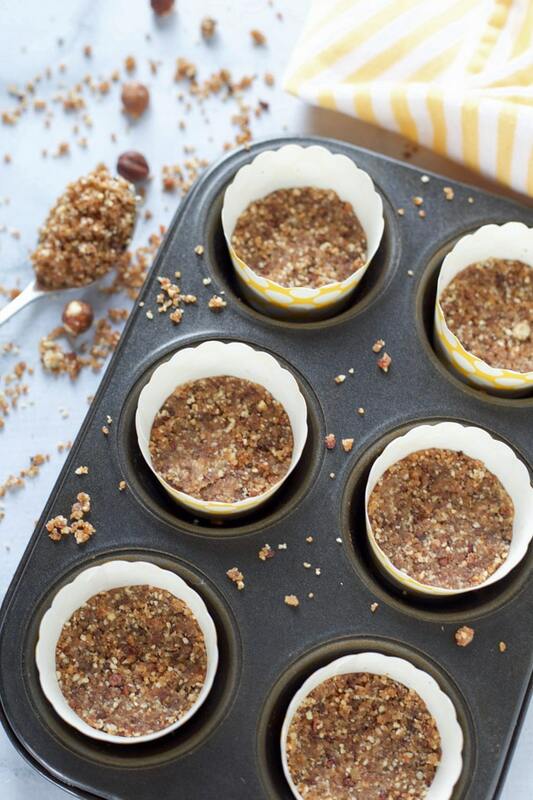 Pour on top of the hazelnut base in the 6 baking cups. Sprinkle with reserved cookie crust crumbs. Freeze for 2-3 hours, or until nice cream has firmed up but is not completely frozen. If the cups fully freeze, just let them sit at room temperature for 10 -15 minutes before serving. Peel away paper cups before serving. I’ve tried this recipe with smooth and crunchy natural peanut butter and found that the crunchy adds a creamier texture to the nice cream and keeps the cookie base nice and crumbly (not chewy or oily). Anything with peanut butter gets my vote! These look incredible! Thanks Annie! I totally agree! 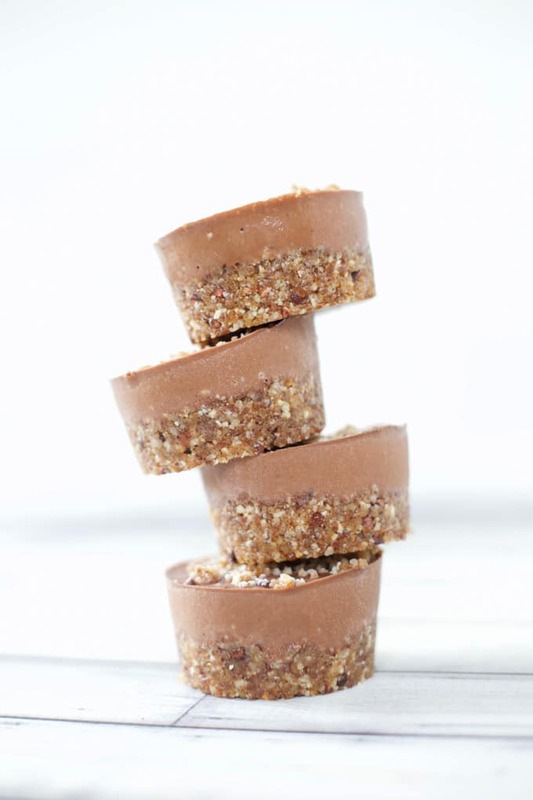 I always have a few of these peanut butter cups stashed in the freezer for a quick dessert. So good!